Also known as Ben Youssef Medrassa or Bin Yousuf (Yusuf) Madrassa, the Ali ben Youssef medersa was a Koranic school named after the Almoravid sultan Ali ibn Yusuf. The school was founded during the Merinid period in the 14th century by the Merinid sultan Abu al-Hassan. 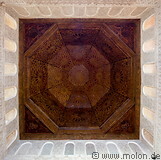 It is the largest medersa in the whole fo Morocco and underwent a restoration in the late 1970s. This medersa is beautiful and has some stunning examples of stucco decorations.